June 2018 16 www.sportseventsmagazine.com One-on-One features an interview with an influential member of the sports community concerning a specific topic. This month we interviewed Drone Racing League CEO/ Founder Nicholas Horbaczewski. BY SHERRI MIDDLETON One- on- One Drone Racing League Leader Shares Lessons Learned From 'Sport of the Future' Horbaczewski What's Your Background? 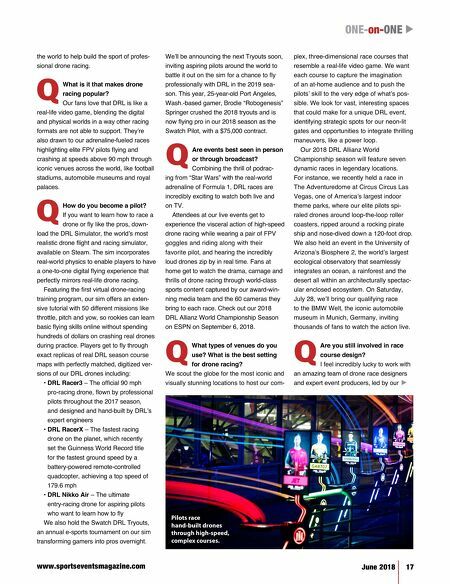 I'm the CEO and founder of The Drone Racing League (DRL), the international premier drone racing circuit for elite pilots that's often been pegged as the sport of the future and a real-life video game. Before founding DRL in 2015, I was the chief revenue officer of Tough Mudder, the largest mass-participation running event series in the world, which grew to over 60 global events and $100 million in revenue during my time there. Prior to Tough Mudder, I developed an inter- est in multicopters while I was the chief information officer of ADS, a distributor of advanced hardware to the U.S. govern- ment. I also co-founded Leeden Media, an entertainment company for feature-length independent films, and bring my love of media production to our work at DRL. When did you become interested in drones and drone racing? In early 2015, our Director of Product Ryan Gury introduced me to FPV (First Person View) racing on an empty field behind a Home Depot in Long Island. It was truly a hobbyist sport at the time, with home-built drones and no real struc- ture. Still, I was captivated by the speed and excitement, and there were moments it reminded me of "Star Wars" and racing video games I had played growing up. I immediately saw the potential for the sport to grow into something bigger than it was and we got to work on building out the technology, media and sports ecosystem required to professionalize drone racing and bring it to a global fan base. What makes drone racing a sport? While drone racing has been around for several years as an under- ground, niche hobby, DRL transformed into a mainstream sport. Like any professional sport, DRL recruits the most elite talent, unites fans around insane competition, has media distribution agreements with the best sports networks like ESPN, Sky and ProSieben, and is sponsored by renowned brands like one of the leading global insur- ers, Allianz; the luxury auto manufacturer, BMW; and Swiss watchmaker, Swatch. To level the playing field and ensure competitors are tested based on skill, our team of expert drone engineers hand-build a fleet of 600 identical racing drones that DRL pilots fly in all season events. With a performance athlete's mindset, skillful hand- eye coordination and steady nerves, our pilots have the same competitive and pas- sionate desire to cross the finish line first, like in any other racing sport. What is your vision for the Drone Racing League? 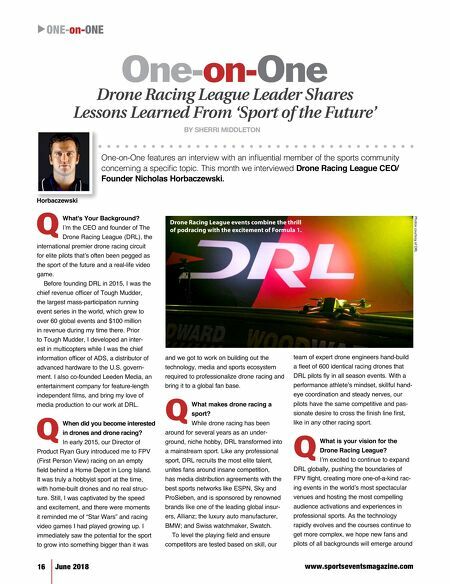 I'm excited to continue to expand DRL globally, pushing the boundaries of FPV flight, creating more one-of-a-kind rac- ing events in the world's most spectacular venues and hosting the most compelling audience activations and experiences in professional sports. As the technology rapidly evolves and the courses continue to get more complex, we hope new fans and pilots of all backgrounds will emerge around Q Q Q Q ONE- on- ONE t Photos courtesy of DRL Drone Racing League events combine the thrill of podracing with the excitement of Formula 1.